EasyTables is an easy simple personal database system. Ready for business as well as for personal use. EasyTables can store all kinds of data. Has password protect function and supports exporting to TXT, HTML and MS Excel. Run EasyTables, open popup-menu in tray, and add/edit information in your safe personal database! You should have Microsoft .NET 2.0 installed (most XP and all Windows 8, 7, Vista already have it). EasyTable help file in PDF format is here (800 Kb). How to delete the existing table? How to view the file with table not added to popup menu? How to sort table columns? How to add data to the table quickly? Can I edit data directly in opened table? Can I have several different tables opened at once? Can I use Drag-And-Drop in tables? How to make table backup? How to open backup table? Where are located files with tables by default? How to add password protection for the table? Will the table encrypted when I use password for this table? How to open internet site, or folder, or run a program contained in a table cell? 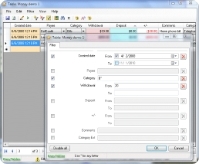 How to export data to Text file, HTML file or Ms Excel? How to save needed rows (or all rows) from table as file? How to open file with data? How to add data from one table (source table from the other folder, PC or from the internet) to another table (destination table on your PC) maintaining the same structure? How to add data from file? What is "table with the same structure"? How to create a table with the same structure? How to get summary (total) info for numerical column? How to get summary (total) info for several selected cells? How to change color (font, alignment) in column? How to install program on USB FLASH drive? What to do if when the message like this one: "Error at initialization of the address (0*с0000135). For Close press ОК..." appears? Run popup menu in tray Table->Create new table. In opened window input the table name (like "My sites") and an icon you like. By default this table will be saved in the file with the same name as the table name (if you want - you can change it) in folder "My Documents\EasyTables\Data" (like "My Documents\EasyTables\Data\My sites.xml"). Add columns that you need using button "+". Select the column name and type. Press "Save" button and close the window. This new table will be added to popup menu in tray. You can open this table using command "Open" in popup menu. If you want to change table properties (to change column names, to add or delete columns) - select "Edit properties of the table".. Select needed table in popup menu and use command "Delete". If you use command "Delete from menu" - the table will be deleted in popup menu but the file with data will be not removed, and you can add it to popup menu again using command "Tables->Add existing table" . How to view the file with table not added to tray popup menu? Use command "Tables->Open existing file with table"
Open table and move needed column header with mouse. Open the table and click on the column header. "Add data from select cell to Filter ". You can open Filter window and set needed data. You can use first letters with symbol "*". Like "*ton" or "t*" for select "Triton". Select needed table in tray popup menu and use command "Add"
Yes, you can use Drag-And-Drop for copying data from external application to the table, or from one table to another, or from one record to another record in the same table. To start Drag-And-Drop use Alt+Left mouse button. Open the table, select "File->Save to backup" in the menu. The table will be saved as a file with a name containing current date and time to folder "My Documents\EasyTables\Backup". Use command "Tables->Open existing file with table" and select needed file from the backup folder "My Documents\EasyTables\Backup". By default files are in folder "\My documents\EasyTables\Data" on PC. If you start the program from a FLASH drive, files are in folder DATA in folder with the program. and select "Comments, Password" panel. If the table has a password, all table data is encrypted. Select needed cell and use Crtl + mouse DblClick (or popup menu->Open file (folder, site) from selected cell). Open the needed table and select the command "Convert to Text, Html, Excel ". If you select some rows (click mouse + Ctrl or Shift on the last left column of the needed rows) from the table, only these rows will be converted. Open the needed table and select the command "Convert to Text,Html,Excel ". Convert data to HTML file, open it in your Web browser and print it. If you select some rows (click mouse + Ctrl or Shift on the last left column of the needed rows) from the table, only these rows will be printed. Open table and select needed rows (click mouse + Ctrl or Shift in the left gray column). Select in menu File->Save selected rows as file->Without password (with password) and choose name of file. If you want to select all visible rows - click on gray cell in left upper corner of the table or use popup menu Select->Select all rows. If you want to save all table rows choose in menu File->Save as file->Without password (with password). Use main popup menu in tray icon. Choose item Tables->Open existing file with table and select needed file. Open the destination table, choose command "File->Add data from file with table " in a menu and select needed file with source table. Open table and select in menu "File->Add data from file with table"
Tables must have same columns. Other tables properties (name, password, file name...) can be different. Open the needed table and select "File->Save as file" or "File->Save select rows as file" or "File->Save as file without data". Open the column popup menu (right mouse click on columns header) and select the command "Summary info for column". Select needed cells by moving pressed mouse above them. Open the popup menu (right mouse click) and select the command "Summary info for selected cells". Open the column popup menu (right mouse click on the column header) and select the needed command. If the program is installed on PC then copy folder with program (by default - C:\Program files\EasyTables) to FLASH drive. If the program is not installed on PC install it before. For program start run file EasyTables.exe. Such message appears when the Microsoft .NET 2.0 package is not installed on PC. © 2013 Nicekit Software. All rights reserved.